Where Lintlikr1 goes, Dormammu follows. This latest Ultimate Marvel vs. Capcom 3 combo video is no exception. Dormammu is getting some support for Lintlikr1's latest Ultimate Marvel vs. Capcom 3 combo video. 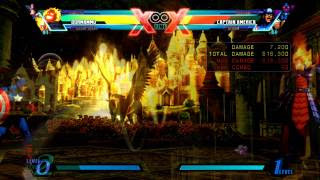 The first part to "Dormammu with Assists" sees the character get help from the likes of Firebrand, Nemesis and others.